European Union referendum wording and facts. Should the United Kingdom remain a member of the EU or not? UK VOTES: A review of the question put forward to all eligible voters. If you did not know already, you're asked to cast your final vote on the big debate during the EU referendum on Thursday June 23rd 2016. 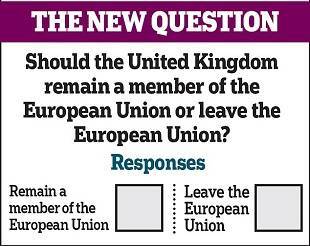 What is the EU Referendum Question? Q. Should the United Kingdom remain a member of the European Union or leave the European Union? But before you think about voting and choosing whether to stay in or opt out. We have a few key facts and figures alongside some essential information about the EU referendum question. They might help you to decide and make the right choice for yourself and for the future of your family living in the United Kingdom. Who is Allowed to Vote in the EU Referendum? You are eligible to vote if you are British, Irish, or a Commonwealth citizen. That is providing you are at least 18 years old on 23rd of June 2016 and a resident in the United Kingdom or Gibraltar. UK citizens who are residing overseas were also allowed to vote in the EU referendum. But, you must register in the voting system at a UK address within the last fifteen years (after 2001). Change your voting preferences (e.g. vote in person or by post). Change your details on the 'open electoral register'. As a rule it only takes a few minutes to register. But you may need your National Insurance number and passport (if you are a British citizen living abroad). Eligibility to vote in elections and referendums means you must be on the electoral register. Note: You must register by the 7th of June if you want to vote in the EU referendum on 23 June (if not already registered to vote). But you do not need to register again if you are already on the electoral register. The best of both worlds: The United Kingdom's special status in a reformed European Union. Alternatives to membership: possible models for the United Kingdom outside the European Union. Rights and obligations of European Union membership. The process for withdrawing from the European Union. HM Treasury analysis: The long-term economic impact of EU membership and the alternatives. Related News: A section covering the latest headlines about rules at home and in daily life. The Electoral Commission is the independent elections watchdog and regulator of party and election finance. There are strict rules that campaigners must follow on campaign spending, donations, and referendum reporting. The UK Government has also published a document informing how campaigning rules affect and apply to businesses around the country during the EU referendum period in 2016. The United Kingdom voted to leave the European Union as a result of the June 2016 referendum. The UK voted to leave the EU by 52% to 48%. Despite the Leave votes winning a majority in England and Wales, every council in Scotland saw majorities to Remain. Note: The Electoral Commission declared that a total referendum turnout, more than 30 million, saw 17,410,742 voters choosing to leave. Homes and Lifestyle Articles: Stories about rules and regulations at home and in our lifestyles. Living in the United Kingdom: How British citizenship rules work for living life in Great Britain. Settled Status UK EU: Check who is eligible and how EU citizens and their families can stay in UK. UK Petition Rules: Learn the principles behind parliament petition wording and signatures.